And When Even The Death Penalty Doesn’t Deter Copying — What Then? This week has seen some disturbing news. British Telecom has been sued into censoring Newzbin2, and domain seizures in the United States were motivated and justified by the flabbergasting "they can have free speech in another country if they like". In the United Kingdom, it appears that legislation to deny people basic communication and fundamental rights still move ahead. In France, the first innocent victims of such schemes are just appearing. I remember the first time a proposed law in Sweden said that people should be cut off from the Internet and sent into social exile for unauthorized copying. It was a proposal written by Cecilia Renfors in close cooperation with the copyright industry. “A very balanced proposal,” said the copyright monopolists in an entitled tone of voice. “Shameless mail-order legislation,” said everybody else. On arriving in parliament, the proposal was thrown unceremoniously into the wastepaper basket, sponsored by no one. The copyright industry just wants more, more, and more, and they don’t think twice about ruining our hard-won fundamental civil liberties to prop up their crumbling monopoly and control. When one tough measure doesn’t work — and they never do — the copyright industry keeps demanding more. A few centuries ago, the penalty for unauthorized copying was breaking on the wheel. 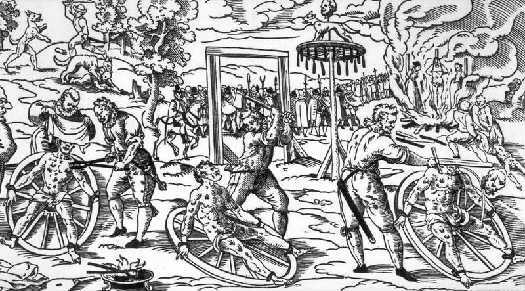 It is a term we’re not very familiar with these days, but it was a form of prolonged torturous death penalty where the convict first had every bone in his body broken, and then was weaved into the spokes of a wagon wheel and set up on public display. The cause of death was usually thirst, a couple of days later. The copy monopoly in those days concerned fabric patterns. It was in France, prior to the revolution. Some patterns were more popular than others, and to get some additional revenue to the crown’s tax coffers, the King sold a monopoly on these patterns to selected members of the nobility, who in turn could charge an arm and a leg for them (and did so). But the peasants and commoners could produce these patterns themselves. They could produce pirated copies of the fabrics, outside of the nobility’s monopoly. So the nobility went to the King and demanded that the monopoly they had bought with good money should be upheld by the King’s force. The King responded by introducing penalties for pirating these fabrics. Light punishments at first, then gradually tougher. Towards the end, the penalty was death by public torture, drawn out over several days. And it wasn’t just a few poor sods who were made into public examples: sixteen thousand people, almost entirely common folk, died by execution or in the violent clashes that surrounded the monopoly. In practice, everybody knew somebody who had been horribly executed for pirating. Capital punishment didn’t even make a dent in the pirating of the fabrics. Despite the fact that some villages had been so ravaged that everybody knew somebody personally who had been executed by public torture, the copying continued unabated at the same level. When will the copyright industry stop demanding harsher punishments for copying, since we learn from history that no punishment that mankind is capable of inventing has the ability to deter people from sharing and copying things they like? Rick Falkvinge is a regular columnist on TorrentFreak, sharing his thoughts every other week. He is the founder of the Swedish Pirate Party, a whisky aficionado, and a low-altitude motorcycle pilot. His blog at http://falkvinge.net focuses on information policy. Follow Rick Falkvinge on Twitter as @Falkvinge and on Facebook as /rickfalkvinge. c There are 217 comments. Add yours?